Three-thirty is pretty early, by anyone’s estimate, to begin the day – or so I thought, but on our painfully slow progress along the bumpy cobbled road away from Cotopaxi National Park and Hacienda El Porvenir to Machachi, there was a remarkable amount of traffic. Dairy workers, ok, understand that – but there were also street sweepers at work, whole buses of people bouncing along, even children standing by the street. They start early, here in Ecuador – school begins at 7am with a free breakfast. Anyway, it was worth the early start because the destination today was that collection of marine volcanoes we know as Galapagos: an hour’s flight to Guayaquil; then less than another two to San Cristóbal. We were scooped up and taken straight out to the boat: the Ocean Spray, a three year-old catamaran that takes just 16 passengers, 34 metres of elegant luxury. Or so I thought. My accommodation is the one single cabin – and by cabin, I don’t mean suite, or stateroom. It’s definitely a cabin. It’s right next to the bridge, so it’s also noisy, unfortunately, even when moored – there’s some humming going on that I will have to make an effort to ignore. But otherwise, it’s lovely - spacious, elegant and welcoming, and everyone on board is nice: there are Americans, two honeymooning English couples, a Spanish mother and son, a Swiss couple, and an adventurous Scottish/English duo who are just beginning a year’s post-children travel. 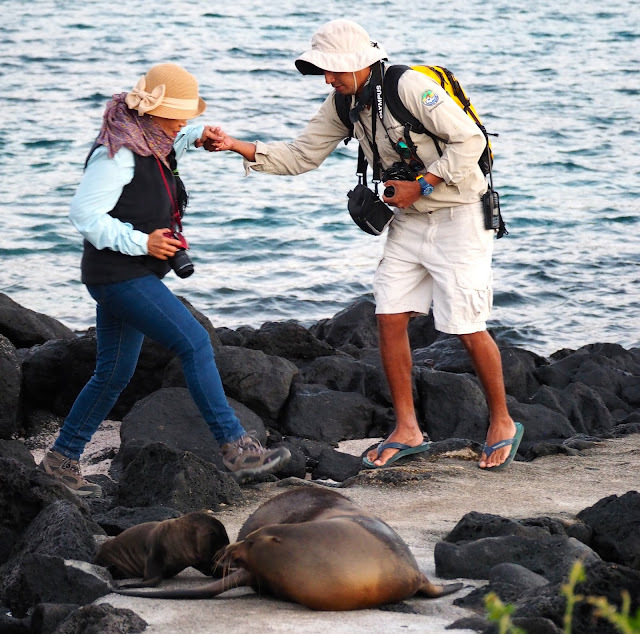 After an encouragingly delicious lunch, we began by snorkelling off a beach on Isla Lobos, the water a bracing 19 degrees, but still full of fish – and, it turned out, playful sea lions interacting with everyone else in the water except me. Next time! One warming shower later, we were in the pangas again on our way to what the brochure called a hike, but was simply a stroll of little more than 40 metres. Eventful metres though: pelicans and sea lions on the jetty, sparring male sea lions and suckling cubs on the shore, blue-footed boobies preening against a backdrop of spectacular Kicker Island blushing in the low sun, frigate birds circling overhead, smaller birds flitting about… classic Galapagos. And then the sun set, red and rapid. And then the full moon rose as we drank a beer back on board before a dinner so tasty that for once I actually cleared my plate. Great start!